For application versatility these all plastic housings will accept most standard 7″ diameter filter bags. The single length vessel uses size (1) filter bag, 7″ x 16″, while the double length vessel uses size (2) filter bag, 7″ x 32″. This permits the vessel to be used with thousands of different types of filter bags to exactly match the applications requirements. With a PVC or CPVC bag filter vessel you are not limited to just a few “non-standard” size filter bags. This all plastic housing is designed to stand up to the most demanding industrial and commercial applications around. Rugged, thick wall construction insures years of trouble free service and the housing is rated at a full 150 psi. The built in true union piping and drain connections makes installation and operation quick and easy. 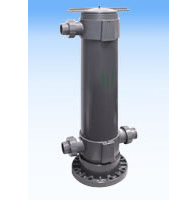 With this feature the filter housing can be removed from the piping system without having to break down the piping system. Just unscrew the assembly nut and remove the connecting pipe. The integral mounting base also makes for an easy installation and eliminates the need for extra cost support legs. The housing has two bottom outlet connections so that either can be used as a drain connection. This makes possible both in-line or loop piping installations. The one piece, corrosion resistant plastic body has an extremely smooth interior surface that is very easy to clean. The housing come standard with a plastic cover vent valve. The hand removable, no tools required, spin-off cover makes filter bag changing quick and easy. There are no swing bolts to deal with like on a metal filter housing. Just a few turns of the cover using the built in 15″ cover handle opens and closes the housing with little effort. A PVC or CPVC housing will never rust, corrode or contaminate the process media and the housings light weight makes installation easy.